The stereotype for women’s college basketball is that the same 4 teams run the table every year. South Carolina, Baylor, Notre Dame and of course, Connecticut. Let’s talk about Uconn. 111. That number stands for how many wins in a row they had going into the 2017 final four. Then they met 2 seeded Mississippi State. Surprisingly, State held a lead for most of the game. At one point they held a 38-28 lead. The Huskies climbed there way back to tie it up and force OT. 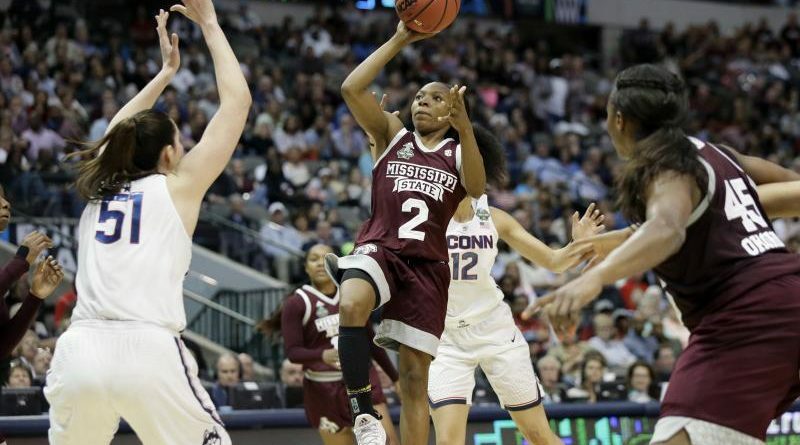 In the overtime period, Miss St ended up outscoring Connecticut 6-4 thanks to a Morgan Williams buzzer beater to pull of the biggest upset of 2017. Our second biggest upset of 2017 came on Friday the 13th when then ranked number 2 Clemson marched their way into the University of Syracuse. Clemson had 90.9% chance to win this game. It was a close game throughout. This can be controversial because Clemson’s starting QB left the game and that had a major impact. Back and forth the two teams went until Cole Murphy nailed a 30 yard kick with 9:41 left to make the score 27-24 ‘Cuse. That score held and the unranked 3-3 Orange knocked off 6-0 Clemson. In both men’s and women’s basketball, it is so rare that a 12th seeded team goes to the Sweet 16. Especially in women’s basketball where it is well known that the best teams win all the time and by a large margin. The Quinnipiac Bobcats women’s basketball team defied the odds as the 12th seeded team in the Stockton region. In the round of 64 they faced the 5th Marquette sitting at 25-8 on the regular season. The Bobcats got off to a 9-0 start which boosted their momentum. Halfway through the 3rd quarter Quinnipiac was up 52-26 then Marquette went on a run and eventually made it a 2 point game at 65-63. In the stretch it was all Quinnipiac and they ended up pulling off the upset 68-65. They weren’t done after that in the round of 32 they faced the 4th seeded Miami Hurricanes. Back and forth this game went and Quinnipiac’s largest lead was 11 to the Hurricanes 4. Once again it came down to the wire and the Bobcats ended up squeaking out a 85-78 win to advance to the Sweet sixteen. In the Sweet 16 they faced South Carolina and no miracle against the Gamecocks. It was fun while it lasted but they ended up losing 100-58. For the third time on this list a story from March Madness in women’s basketball. Only thing that can top a 12 seed going to the Sweet 16 is a 10 seed going to the Elite 8. The Oregon Ducks beat some really good teams including 7th seeded Temple. It wasn’t easy. In fact they were losing from 6:02 in the 3rd to the 4:08 mark in the 4th. It was 70-69 Temple with under 10 seconds left when Ruthy Hebard drilled a clutch bucket with 5.5 seconds left to push them into the round of 32. In the round of 32 the Ducks played the 2 seeded Duke Blue Devils who are a powerhouse in both men’s and women’s. The final score was 74-65 Ducks and it wasn’t close at all. Duke never held a lead in the whole game. The largest lead was 15 for Oregon and their highest scorer was Ruthy Hebard with 20 points. That set them up for a Sweet 16 match up with Maryland that has the 3 seed. Once again, it was all the Ducks. Up until early in the second, it was a close game. Then a 17-7 run to end the half but them up 9 and they never looked back. The final was 77-63, and a new high scorer was Sabrina Ionescu had 21 in the win. In the Elite 8 they faced at that point, the best team since 2000 in Connecticut. The Ducks ended up losing 90-52 which ended up being the final win of the streak for UConn. Number 2 Miami went into Pittsburgh trying to find their 11th win to make them 11-0 and pretty much secure their spot in the playoff. Pitt sat at 5-6 and can’t be in a bowl this season so many fans called this their bowl game. Well, Pitt played like it. Pittsburgh QB Kenny Pickett had a day. He threw for 193 yards and a TD on 18 completions. He also had 60 rushing yards and 2 TD’s. for the majority of the game it was 10-7 in favor Pitt. Everybody was waiting for Miami to explode but it never happened, in fact Pitt exploded and went up 24-7 in the 4th and ended up pulling of a well deserved win with a final score of 24-14 that sent then number 2 Miami all the way down to 7 and needs to beat number 1 Clemson to make the playoff. Barley making the playoffs with 94 points which is tied for 15th in the NHL, the Nashville Predators got the 8th seed in the Western Conference. A lot of people wrote them off and saying they might as well not show up for the first round matchup against the Chicago Blackhawks. Well, the Preds showed up. Nashville absolutely obliterated the 1 seeded Hawks and swept them to move on to the second round against the St. Louis Blues. The Predators went up 3-1 in the series and lost game 5 on the road. In game 6 they were at home and needed a win to advance. In game 6 the Preds ended up winning 3-1 and winning the series 4-2. Next up were the Anaheim Ducks who struggled against the Oilers, squeaking by in 7 games. It was a hard fought series throughout. In game 1 the 2 teams went to overtime and the Preds won on a James Neal goal in OT. The series was 2-1 NSH. This was a game for the ages and it went to 2OT and seemes it could go to a third one but when Corey Perry scored the series was tied at 2. The Predators ended up winning the next two games and made it to the Finals where they lost in 6 games as the Penguins repeated as champions of hockey. Once again another run in march madness, this time in the men’s tournament. South Carolina got selected into the 7th seed in the East region. In the first round they played Marquette and as expected the won big 91-73. In the round of 32 the competition got tougher as they faced powerhouse, Duke. Duke was projected to win this game. It seemed as the Blue Devils would win as they jumped out to a 28-18 lead. SC slowly made their way back and took the lead with 11:07 left in the 2nd half. They never looked back and winning and pulling off the major upset 88-81. In the Sweet Sixteen their next opponent was the 3 seeded Baylor Bears and this, just like the Marquette game just wasn’t even close. Baylor had a 13-11 lead but then it was downhill from there. The Gamecocks went on a 16-0 run to take a 31-15 lead and ended up winning 70-50. In the Elite 8 the Florida Gators were next on the list. Back and forth this game went. 20 lead changes and the largest lead was 7 for Florida until the end when South Carolina was clutch down the stretch thanks to Sindarius Thornwell who scored 26 in the 77-70 win to win the East region. Usually in the Iron Bowl, Alabama wins by a pretty large amount. But when Auburn has 9 wins Nick Saban is 0-7 against the Tigers. Going into the game Alabama was ranked #1 to Auburn’s #6. The winner earns a bid to the SEC Championship against the Georgia Bulldogs. Kerryon Johnson started the game off with a TD pass, yes a TD pass from the RB to Nate Craig. Auburn had a chance to make it at least 10-0 but a fumble gave Bama the ball and a score to make it 7-7. At the half it was 10-7 Tigers. The Tide came out of the half with a TD thanks to a Bo Scarbrough 21 yard run. After that the Tigers took control and scored 16 unanswered to win the game 26-14. Auburn might have taken the Iron but Alabama took the gold by making the playoffs and Auburn didn’t. The Patriots came off of a 25 point comeback to win Super Bowl 51. They went out and added Brandin Cooks, Stephon Gilmore, Dwayne Allen and Kony Ealy. Everybody was saying that the Pats would go 16-0 once again. Surely Alex Smith wouldn’t be a threat right? Think again. 3 minutes into the game the Patriots scored to make it 7-0. Looked like they were going to destroy the Chiefs D. That wasn’t the case because it was 17-14 Patriots at the half. Then somebody named Kareem Hunt introduced themselves to the world. He scored 2 4th quarter touchdowns including the a 78 yard TD. He had 298 total yards and Alex Smith had 368 yards and 4 TD’s in the 42-27 win in Foxboro.